We are pleased to announce that the semi-finalists have been chosen in the 2017 Spinner Ring Design Contest. The winner(s) will be chosen by voting, which closes on August 30th at 11:59 PM ET. To vote, check out the semi-finalist entries below and then scroll down to the bottom of the page to anonymously cast your vote for your top 3 favorite designs. Please, one vote per person. Vote below for the 3 designs you like the most. One vote per person, please. To vote, click the check box next to the 3 designs of your choice and then click the Submit button at the bottom of the list. Design Stimtastic's next spinner ring! We're looking for an exciting new spinner ring design. If you have an idea for a spinner ring pattern, enter it in our design contest for a chance to see your creation become Stimtastic's newest piece of fidget jewelry! Create a 2-dimensional black and white rendering of your idea. Submit it by email by August 15, 2017 with the subject line "Spinner Ring Design Entry". In your email include: your full name, the name of your design, and a statement saying that you have read and agree to the contest entry guidelines below (you can copy this if you like: "I have read and agree to the Stimtastic Spinner Ring Design Contest guidelines posted at Stimtastic.co."). Download the design template and save it to your computer. Do not alter the template dimensions (1465px by 165px at 300 dpi). Using the design template, create your design in black and white. Your design must have exactly 8 symbols of equal size. They can be 8 repetitions of the same symbol, 8 different symbols, or a repeating pattern that adds up to 8. Solid black and white symbols only. No grayscale, feathering, shadows, groupings of very narrow lines, hatching, shading or other areas of color that are not solid black. Your submission must be a computer rendered graphic image. Hand drawn images are not eligible. Submit your design as a .jpeg or .png file. Your submission must be your original idea. No copies, derivatives or otherwise modified versions of copyrighted work. You must be willing to give Stimtastic exclusive permission to reproduce your design as a spinner ring for sale by Stimtastic in perpetuity. Use the template as your guide for sizing and distribution of your symbols. Fill the entire horizontal area, leaving room for space between the first and last symbols on the ring's band. Leave space at the top and bottom of the template (approximately equal to the grey area shown below) so your symbols do not touch the edges. Photo description: Horizontal white rectangle with thin gray bands at top and bottom and the words "No artwork in gray area"
The illustrations that follow are intended to give entrants an idea of suitable entries. Photo description: 4 evenly distributed triangular symbols, each pointed in a different direction, and the words "repeat 2 times"
Photo description: 1 triangular symbol and the words "repeat 8 times"
Semi-finalists will be chosen by a panel of judges based on a set of judging criteria to include originality and feasibility of production as a spinner ring design. Semi-finalists will then be voted on by the public to choose a winning design. It's common for spinner rings to occasionally become squeaky or hard to spin. Most often cleaning and/or lubricating your ring will quickly solve the problem. You can clean your ring by giving it a bath in warm soapy water. 1. Gather the following items: a bowl or other container of warm water (large enough to submerge your ring and hand in) and mild dish soap like Ajax, Dawn or Ivory. 2. Pour a small amount of dish soap into the warm water. 3. Swirl the water around until you see some bubbles on the surface. 4. 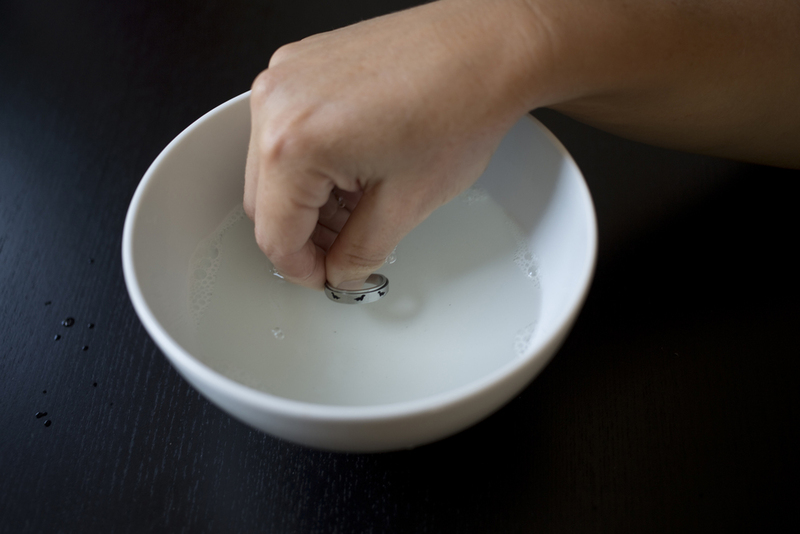 Submerge your ring in the water and spin it back and forth a little to try to loosen up any stuck on dirt. If your ring seems especially dirty, let it soak for about 5 minutes then try spinning it again while it is submerged. Once you get it moving, spin it in both directions a few more times to loosen any remaining dirt. Regularly adding some form of lubrication to your spinner ring can keep it spinning quietly and smoothly. If your ring is squeaky or continues to be difficult to spin after cleaning it, try lubricating between the inner and outer bands as shown below. 1. To begin, you will need a suitable lubricant. Customers have reported good success with: commercially available silicone products (industrial, automotive or personal lubricants), graphite (commercially available graphite-based lubricant or ground up pencil lead) and vegetable based oils (especially coconut oil). Because lubricants can stain, it's a good idea to cover your work surface with an old rag or a few layers of paper towel. 2. To apply a liquid silicone product (like personal lubricant) or vegetable oil, simply apply a small amount to your finger and rub it along the inside and outside of the ring where the bands meet. 3. Spin the ring back and forth to work the lubricant between the bands. Once the ring is spinning smoothly and quietly, wipe it off with your paper towel or rag to remove any excess lubricant. 4. To apply an aerosol lubricant (graphite or silicone based), follow the instructions on the product you have selected to apply a small amount of lubricant along both edges of the band. Follow Step 3 above, adding more lubricant if necessary. 5. To use graphite from pencil lead, first grind a small amount of pencil lead into dust (by crushing a replacement stick of lead or shaving it from a pencil tip). 6. Apply the powder along the edges of the bands and continue as explained in step 3 until your ring spins smoothly. Be sure to wash your hands thoroughly when you are finished to remove and residual dust from your fingers. Congratulations to the winners of the Stimtastic Spinner Ring Design contest! Alicia is a college sophomore currently studying design and psychology. She has been drawing since elementary school and enjoys gaming and reading in her spare time. She can often be seen doodling funny faces in the margins of lecture notes. Baden Gaeke Franz is a university student studying Human Rights and Women's and Gender Studies. She loves to sew and knit and to drink tea while snuggling her cat. Allen is a 23 year old nonbinary college student, currently going to community college for their AA, and living in the California Bay Area. They have always had problems with anxiety, but never really liked any of the ring designs they found on the market. Which is why they jumped at the opportunity to design their own. Allen spends most of their free time drawing, with most of their interests including biology, food, comics, and animation. Allen would like to eventually get a major in entomology or something in scientific illustration. But they really just hope to one day make a living off of doing the things that they love, and to help the marginalized communities they are a part of. Look for all three rings on Stimtastic.co in late October! We are pleased to announce that 9 finalists have been chosen in the Spinner Ring Design Contest. The winner(s) will be chosen by voting, which closes on Sept 28th at 11:59 PM EST. To vote, check out the 9 finalist entries below and then scroll down to the bottom of the page to anonymously cast your vote for your top 3 favorite designs. Please, one vote per person. Note: Designs were submitted in several formats. To create parity in voting, we have chosen to show a segment of each ring design, which will repeat 2-3 times on the finished rings.